Man, I should really be writing this stuff down! Head on over to my friend, Paula’s “Just a Moment” blog, celebrating teachers who write. As writers, we write what we know best. As teachers, what we know best is our students. After serving eight years as a literacy coach in my district, I decided to dip my toes back into the rejuvenating waters of the classroom this past year. I changed schools and accepted a position as a first grade teacher. We’ve all had those moments when we say, “Man, I should really be writing this stuff down!” Well, this year I did. Here is a tiny window into some of the many priceless experiences I shared with eighteen 6-year-olds over the course of our ten months together. Charles William Eliot said, “Books are the quietest and most constant of friends; they are the most accessible and wisest of counsellors, and the most patient of teachers.” Throughout my life, books have been a constant. I grew up on my grandparents’ farm, surrounded by reading. Whether it was Grammie reading cookbooks or her Bible, or Grampa reading a Zane Grey or Louis L’Amour western, I grew to understand that books were powerful. And sometimes they help you express the things you want to say when you have no words of your own. My 93-year-old grandfather passed away this week. Yesterday we had his funeral service. I wanted to share what he has meant to me, but the thought of that was admittedly overwhelming. So I turned to what I knew- books. A few years ago I was at a book signing event with Lynn Plourde and I picked up her book, Thank You, Grandpa (2003). Having a close relationship with my grandfather, the title and the artwork (by Jason Cockcroft) immediately drew me in and I read the entire story while standing in the signing line. Thank goodness the line was long, because it gave me a chance to dry my eyes by the time I got to the front of it to have Lynn sign my copy. I brought it home and it sat on my bookshelf for four years. As strange as it sounds, it was a book that brought me comfort just by knowing it was there. You see, I had plans for that book. Plans that I didn’t want to confront until the time came when I had to. Yesterday it was time. I shared it with those gathered to celebrate my Grampa’s life. When I failed to find words to convey what was in my heart, that book gave me strength. I took a deep breath and began to read aloud. The more I read, the stronger I felt. Lynn’s book enabled me to find my voice for the man I loved so dearly. I am so thankful I was raised by those who valued reading and saw it as important and life-changing. It continues to sustain me through difficult times. Books remain a constant for me, even when life tosses me around. For that, I am grateful. I was participating in a Twitter chat last night and a question came up about how we share with families the importance of reading and writing at home. In my answer, I mentioned that our school decided to eliminate formal homework this year and instead ask parents to focus on sharing books together as a family. That’s a short answer, of course, that’s only capable of fitting into 140 characters, so I wanted to take the opportunity to elaborate a bit on our thinking. We are a Title One School of just over 100 students in pre-k though fourth grade. Each year we set goals based on our data, including literacy, math, attendance, and behavior. This year an area of need for us was to strengthen our school-wide reading community, as well as our level of family involvement. We wanted our students and their families to see reading as a pleasurable activity , rather than drudgery or a required task to be documented daily. We’d seen what recent research, such as that from ASCD, has to say about the overall impact of homework, including the pros and the cons. We were familiar with Alfie Kohn’s position on the matter. We’d also seen the evidence of requiring students to complete nightly reading logs or worksheets, practicing long lists of spelling words, and the like. Weighing those factors, we determined that for the benefit of our students, we needed to shift our thinking about homework. So we took a drastic step. Read at bedtime: Everybody enjoys a story at bedtime to wind down. Older children, too, enjoy this nighttime ritual. Buddy read: When parents are busy or tired, siblings can share a book by taking turns reading to each other. Older children can read a longer passage, and younger ones can read the parts they know. Have book conversations: Stop to talk about what’s happening in the print and the illustrations of the book. For younger children, run your finger under the print and point out words they may know. Go to the library: We are lucky, in that our public library is located right on Main Street and is a pretty central location for many of our families. It offers an outstanding selection of print and audio books and holds regular story times. Cook: Prepare meals together and encourage children to read the directions or recipes. Play games together: There are plenty of games that involve reading and learning letters, words, and numbers. Other lessons involve turn taking, communication skills, and conversational moves. Play outside together: Playing or walking outside gives families time to talk, teaching children important language skills and building their vocabulary…as well as getting heart rates pumping and giving family members quality time together! Set up a reading environment: Have a space where the family’s books go so they are always accessible and children can help themselves whenever they want to read. As a culminating activity at our open house, we purchased new cardboard magazine holders and gave one to each student to decorate as their home library. Many of our students come from high-poverty and sometimes transient homes and at the very least, they would now have a specific space in their home where they could store their library books and books that came home from the classroom or book swap shop, book fairs, etc. Every morning our entire school gathers outside at our flagpole for greetings, announcements, and flag salute. This year we added a daily book talk. Students sign up with our principal when they have prepared a book talk about something they’ve read that they want to share with our school community. As an added incentive, each student who shares a book talk gets to choose a book from our book swap shop. In our first grade classroom, we conclude our morning meeting with the invitation from me, “Who read a great book last night?” Consistently, hands shoot up into the air (and I jot that down)! I keep track of the three students who share a book talk each day on a chart for my own anecdotal data purposes. The chart contains the date, the students’ names, the title of their book, comments on what they shared (if they were able to recount characters’ names, details from the beginning, middle, and end of the book, if they gave a summary, why they liked the book), and how the book was shared. Did they read it to someone and if so, who? Did someone read it to/with them, or did they read it to themselves? This lets me look back at each week’s data and determine who’s been reading, who’s shared, and how their book talking skills are developing. This being said, we decided as a staff (and communicated to parents) that if students had in-class work that they had been given ample time to complete, but had not, that we would send it home to be completed. I can count on no more than my two hands the number of times I have actually had to send unfinished work home this year. Much of that, I believe, is due to the fact that students don’t want anything to encroach upon their nightly reading time. Every day I see our students making connections with one another about what they’re reading. I hear from families the amount of stress that has been relieved from their lives, and the excitement and passion for reading that has been reignited for our students. The Secret is Out: Maxi is Outstanding! After returning today from a week’s vacation on the Schoodic peninsula in Acadia National Park, I’m a day late for an “It’s Monday! What Are You Reading?” post. However, I’m just in time to wish a Happy Book Birthday to Lynn Plourde for her new book, Maxi’s Secrets (Or, What You Can Learn From a Dog). I was so excited to read Lynn’s first middle grade novel after enjoying her many picture books over the years and Maxi’s Secrets did not disappoint! It’s the story of a boy, Timminy Harris, whose family moves from the city of Portland to a more rural town in Maine, where his dad has taken a job as the new assistant principal at Timminy’s middle school. The fifth grader’s small stature and wisecracking, yet self-deprecating attitude make him a magnet for bullies, but when his parents try to ease the impact of the move on him by getting a new puppy, Timminy’s world gets turned upside down. You see, the Great Pyrenees pup, Maxi, is deaf. Timminy tries to teach Maxi everything he can to keep her safe, but in the end, it’s Maxi who teaches Timminy important lessons about life, friendship, and bravery. Normally, I’d insert a “spoiler alert” here, but Lynn puts it out there for the reader in the first two sentences of the book- Maxi dies. And truthfully, I wasn’t sure how I would proceed after reading that, knowing what was ultimately going to happen, but the story pulled me in. I found myself connecting with the Maine elements sprinkled throughout the text, and even more importantly, I connected with the characters and how their own issues, dreams, and storylines were woven into Maxi’s tale. There’s Abby, the Harris’ blind neighbor who is too young for a guide dog, but yearns for more independence, Rory, another neighbor, a.k.a, The Big Jerk, who is seemingly Timminy’s worst nightmare of a bully, and a cadre of other Maine middle schoolers who want to be liked and accepted- just like any tween. Lynn’s experience in the school setting as an educator herself, along with the tons of encounters she has with kids during her author visits have given her the perfect voice to write this story. I laughed at the middle school humor and yes, cried when Maxi passed. This book transported me back to my own middle school days, and carried me back through times when I’ve had to say goodbye to beloved family pets. But perhaps it is the way Lynn confronts these issues head-on that I most appreciate. Kids want truth and honesty from life and books and Maxi’s Secrets offers just that. I’ll be heading to one of Lynn’s launch signings tomorrow afternoon at Books ‘n Things in Norway. I hope to see you there! For more information on where you can find all things Maxi, as well as information on Lynn’s newest upcoming picture book, Bella’s Fall Coat, check out her website at www.lynnplourde.com . You can also find her author page on Facebook. IMWAYR? posts originated at www.teachmentortexts.com and have taken off from there! It’s a great way to collaborate with colleagues, near and far, about what texts folks are currently reading. This week has been all about picture books for me! One of my new favorites is A Squiggly Story, written by Andrew Larsen and illustrated by Mike Lowery. It’s the tale of a very young boy who wants to write a story, but is hesitant because he doesn’t know many words. His big sister, whom he strives to emulate, reassures him that a story can start with just one letter. So he picks up his pencil and writes an “easy letter,” the letter I. His sister prompts him when he gets stuck and encourages him to keep going. The boy is so delighted with his creation that he takes it to school and shares with his class what he has written so far. His classmates, in turn, offer suggestions for how he could end his story. One of the most beautiful parts in the book occurs when the boy comes home and tells his sister he is still undecided about his conclusion and his sister reminds him that he can do whatever he wants, for HE is the author. This book is sure to be a “kinder-crowd-pleaser!” For all those times when early writers feel stuck or self-conscious about their writing abilities, this is a book that you will want to have handy! What I also appreciated about this book was that the illustrations capture what early attempts at writing can tend to look like and celebrates them. Coming this September, A Squiggly Story is sure to be a favorite for our littlest authors, as well as their parents and teachers! This Monday I’ve been reading an ARC for my #bookaday challenge that I got from Simon & Schuster at the recent ILA Conference in Boston. Frances O’Roark Dowell, author of the Phineas L. MacGuire series and many other titles, has written a charming, heartwarming tale about a boy with a plan. In Sam the Man & the Chicken Plan, Sam Graham is a seven-year-old in search of employment. Both his parents and his older sister, Annabelle have jobs, and when their neighbor, Mrs. Kerner, needs someone to watch her chickens while she’s away, Sam sees his opportunity. Admittedly, I was drawn to this book because of my love-hate relationship with our own chickens. Slowly, they’re helping me overcome my small phobia of winged creatures, so I found myself empathizing with Sam as he strived to become an expert, in order to do his best as chicken caretaker. We also meet several other people in Sam’s community, including Sam’s teacher, Mr. Pell, his classmates, and Sam’s bus driver, Miss Louise. But it’s Sam’s other neighbor, Judy, and her cranky old dad, Mr. Stockfish, who help teach Sam that true happiness doesn’t cost a thing. Dowell has created a funny, curious main character that readers will root for from beginning to end. Sam the Man & the Chicken Plan arrives in bookstores next month and the follow-up text in the series, Sam the Man & the Rutabaga Plan is scheduled for release next winter. After a long hiatus from my blog, summer is back and so am I! It’s been an incredibly busy school year, with taking four graduate classes and helping to design a new one, but the most amazing news contributing to my busy life is that I am heading back into the classroom this fall to teach first grade! After dedicating my professional career exclusively to literacy coaching for the past eight years, it is time for me to return to a classroom setting. I feel passionately about coaches cycling back into the classroom every so often and when this opportunity presented itself, I couldn’t refuse. (And as an added bonus, I’ll be cutting my commute by about 40 minutes each way). This summer I’m taking a graduate course on family and community involvement and I’m wondering, teachers, what are some successful ways you have found to engage families in your classroom community and parents, what are some ways that schools have included you in your child(ren)’s learning that you have appreciated? I’m so excited to begin this next chapter of my professional journey! This summer I’m again participating in the #bookaday challenge. Today’s book is What Do You Do with a Problem? by Kobi Yamada and illustrated by Mae Besom (Compendium, Inc., 2016). I own their other book, What Do You Do with an Idea? and was anxious to read this one. It’s the story told from the child narrator’s perspective, but it can easily be applicable to anyone of any age. It’s the story of what happens when a problem follows you around and just won’t go away. I love that one of the messages in this book is that problems can actually be opportunities in disguise! This book would be a great read aloud for setting the stage to problem solve classroom conflicts or as a gift for someone who’s going through a difficult time and needs some encouragement. Last week I needed to take my husband’s truck to the local dealership to get an estimate for some body work. As I usually do when facing a waiting room situation, I try to avoid having what Donalyn Miller calls a “book emergency.” This means stashing a book in my vehicle, my laptop bag, or in last Wednesday’s case, my oversized purse so I can steal some extra reading minutes. After handing over the keys, I settled into one of the leather chairs and pulled out Raina Telgemeier’s new graphic novel version of Ann M. Martin’s “The Baby-Sitters Club: The Truth About Stacey.” I flipped to the page that held my bookmark and returned to the fictional town of Stoneybrook. A couple minutes went by and I had that feeling that someone was watching me. I lifted my eyes from the book and noticed one of the service reps glancing my way. Returning to the babysitters, a few more minutes passed. A mechanic walked by. Then a customer. And another. But most of all, if I was being truthful with myself, I was reading it because I simply enjoyed it. I had grown up with The BSC series and though I am so excited to share it with a new generation of readers, I am equally excited to transport myself back to a familiar, comfortable place and spend some time with familiar, comfortable characters. But I didn’t say that. I didn’t say any of it. I slowly closed my book and sat quietly, thinking about what I had just experienced. And I thought about our students. The students whose texts evoke awkward feelings of embarrassment for them. Perhaps they’re sitting in a guided reading group or carrying around an overflowing browsing box filled with books labeled “Level G.” We, as teachers, need to be mindful of the texts we require students to read and take into consideration their perception of it. Even more importantly, we need to foster a community of acceptance where it is safe to read what you choose, safe to experiment with book choice, and safe to take risks as readers. I’ve seen a lot of posts recently from author friends about the fact that there should be no qualifying of literature as “a good boy book” or “a good girl book,” that there are simply GOOD BOOKS. I agree with this premise wholeheartedly. Our children deserve to be able to make their own choices about what they choose when it comes to independent reading. They shouldn’t have to feel like they need to carry around a four-pound Harry Potter book in order to be seen as a “good reader.” Likewise, reading Elephant & Piggie books doesn’t make someone a “bad reader.” Have you read that series?! It’s darn funny and this 42-year-old highly proficient reader quite enjoys it! This school year, I urge you to think consciously about the messages you send to your students, both verbal and nonverbal messages. 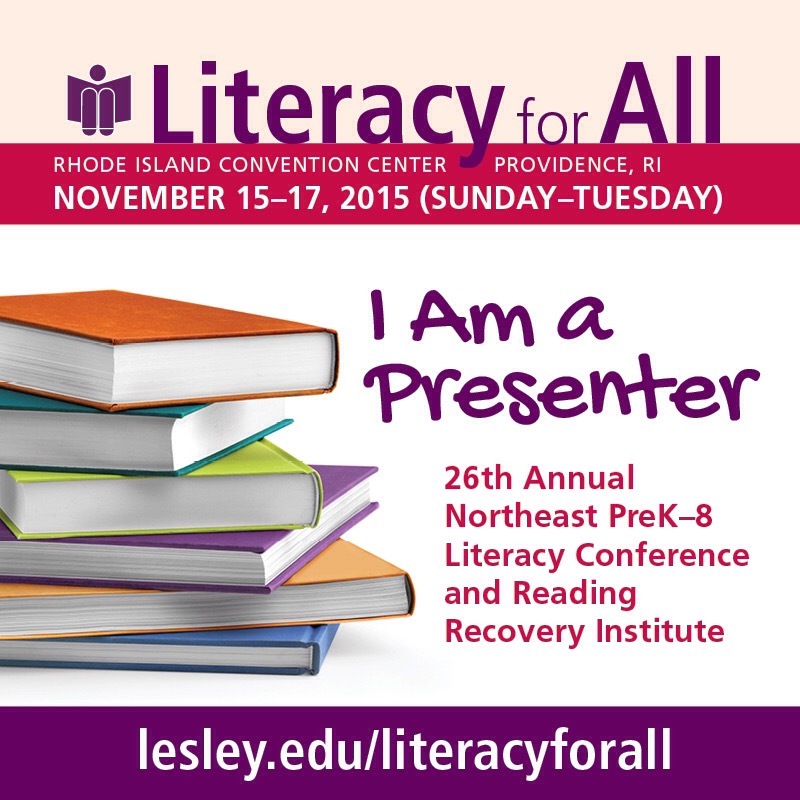 Celebrate ALL readers, ALL reading, and establish a safe literacy community for ALL learners. 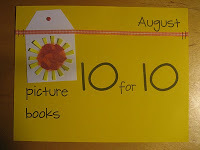 Picture Books 10 for 10! Once again I’m participating in Cathy Mere’s “Picture Books 10 For 10” (#pb10for10). This time around I decided to choose picture books that cause us to crack up, giggle, and belly laugh. Laughter in the classroom is such an instant way to build community and forge connections. 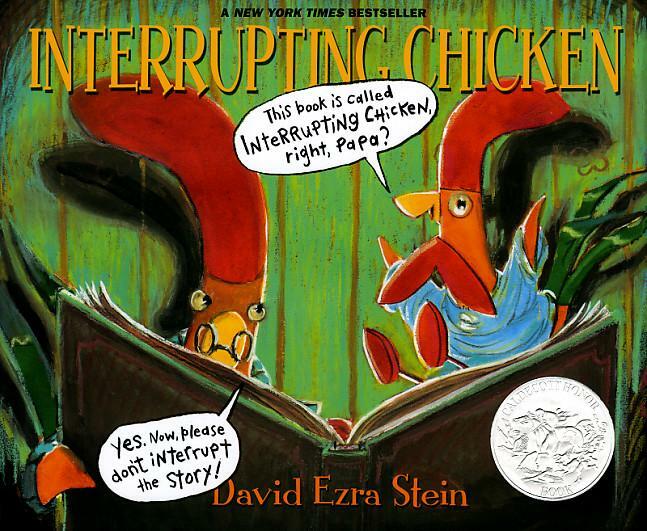 “Interrupting Chicken” by David Ezra Stein is the hilarious tale of a father trying to share a bedtime story with his little one, who is sooo excited that he just can’t help himself from interrupting his dad time after time. 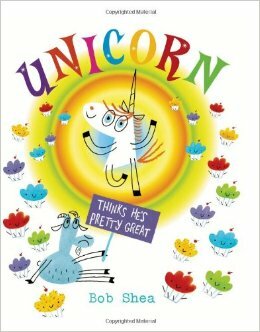 This is a great read aloud, especially with the unpredictable outbursts throughout the story. A 2011 Caldecott Award Honor book, “Interrupting Chicken” is not only funny, but embeds within it a lesson in manners and patience. 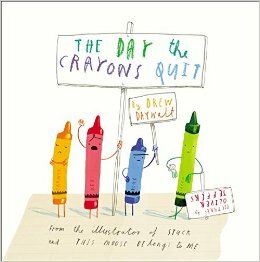 “The Day the Crayons Quit” by Drew Daywalt & illustrated by Oliver Jeffers was not only a hysterical account of the plight of a box of crayons, it made for a wonderful addition to my persuasive texts collection. Written as a series of letters to their owner, Duncan, his crayons have decided to revolt against what they each feel is unjust treatment. And let’s face it, it stands to reason that Yellow and Orange Crayons are no longer speaking because they each believe they are the true color of the sun! 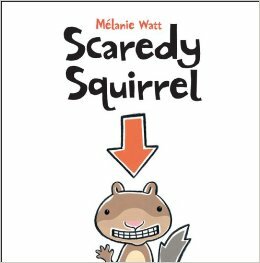 I first came to know the “Scaredy Squirrel” series by Melanie Watt when I was training to be a literacy coach. We had gone to visit in a second grade classroom and at the back, by the classroom library, was a HUGE Scaredy Squirrel display. There were several different titles featured, writing that students had done based on Scaredy Squirrel read alouds, and as I ventured over to have a closer look, I was immediately surrounded by about half a dozen eight-year-olds, all singing Scaredy’s praises, asking me if I had read any of the books and recommending their favorites. I picked up one (the first one, as one student told me, was “the most logical place to start!”) and I was hooked! This series is about finding your inner strength and be willing to take risks. In the end, who wouldn’t love a bushy-tailed hypocondriac rodent, with a little OCD?! 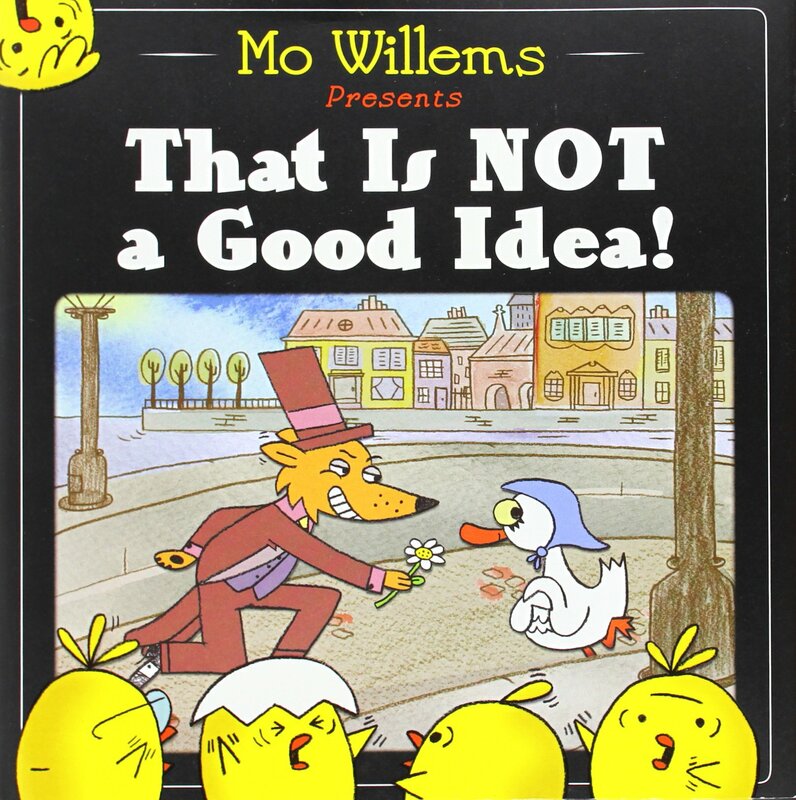 I am a HUGE Mo Willems fan to begin with, so if I have to narrow it down to just one of his books, I’ll go with one of his newer titles, “That Is NOT a Good Idea!” In typical Willems style, this book builds big anticipation throughout it, with a funny twist at the end that even I didn’t see coming! No spoilers, though! I highly recommend you check this one out! While I have not used this in my classroom (spoiler alert: it does include the word ‘jackass’ and I’m pretty sure it is meant as a double entendre! Ha, ha! 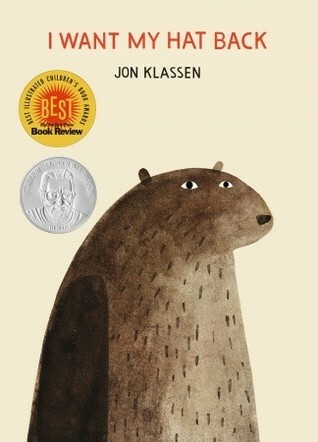 ), I have shared this book with the folks in the graduate literacy courses I teach and they think it is a complete HOOT! For bibliophiles everywhere, this book, (you know, the print kind where you turn actual pages! ), is a tribute to the “hold-in-your-hand, smell-the-newness, and hear-the binding-snap-for-the-first-time” stories that are still holding their own in an age filled with technology and digital media. Ok, I admit it… I’m trying to squeeze in a “two for the price of one” with this one! 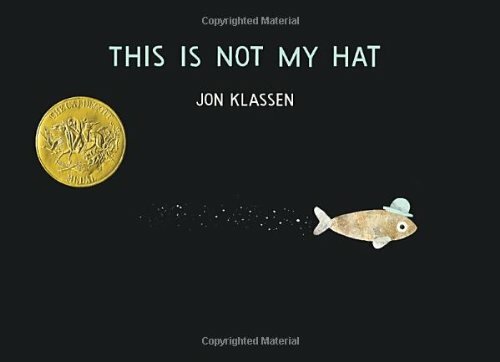 My students and I fell in love with “I Want My Hat Back” and we were so eager to get our hands on the follow-up picture book and 2013 Caldecott Medal winner by Jon Klassen, “This Is Not My Hat.” Talk about texts that use illustrations to their fullest advantage! The storyline (and the humor!) is conveyed through the pictures, which also lets the reader in on the jokes. Kids will beg you to read these over and over again! 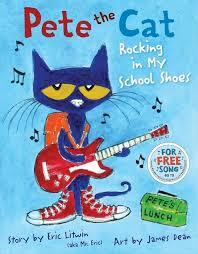 This picture book made my list this year for the simple fact that it makes kids smile! Every. Single. Time. 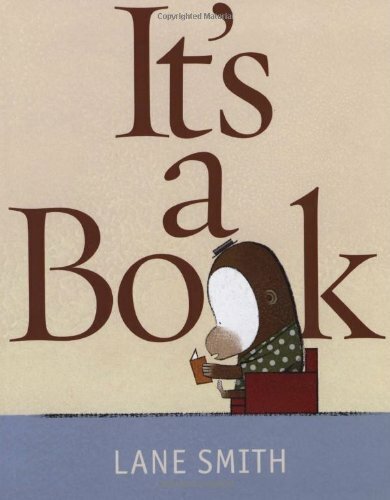 I shared this book with a class of eight-year-olds one Wednesday during our weekly “Picture Book Palooza!” at the recommendation of my friend, Bailey, their second grade teacher. It’s a classic “the grass is always greener” tale with smart comic relief thrown in. Goat has been agitated since Unicorn showed up on the scene and feels that everything Unicorn has and does is better. Then one day, Goat discovers that Unicorn has some envious feelings of his own and together they dream of using their unique superpowers to rid the world of evil. Written by one of my favorite picture book authors, Ame Dyckman and illustrated by Zachariah OHora, “Wolfie the Bunny” is the story of a baby wolf adopted by a family of bunnies. Wolfie’s sister, Dot, seems to be the only member of the family concerned that their new addition might actually, you know, EAT THEM! Dot spends the majority of the book trying to get her family to see the error of their ways, but when the chips are down, Wolfie might actually save the day. Ok, admit it- who among us tweens back in 1986 (before ‘tweens’ was even a word!) didn’t want to start their own babysitting club, thanks to Ann M. Martin’s popular series?! Being the founder of a failed neighborhood girl band (we all wanted to be the lead singer because none of us could play guitar), I began to set my sights on other business ventures. I remember trying in vain to rally my friends in an effort to combine our talents in the area of below minimum wage childcare. It wasn’t so much the budding entrepreneur in me, as it was the desire to take part in something a bit bigger than just the occasional afternoon playdate or sleepover. 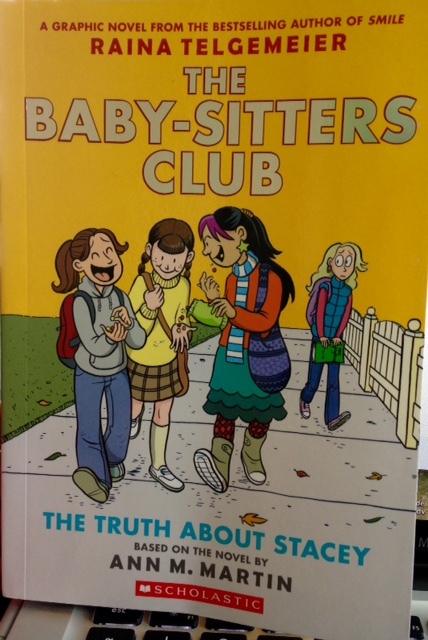 I was elated when, based on my prior purchases of Smile, Drama, and Sisters by Raina Telgemeier, my friendly online bookseller recommended her graphic novel version of Martin’s, “The Baby-Sitters Club: The Truth About Stacey.” And last week, my pre-order arrived! Instantly, I was transported back twenty-nine years to the first time I cracked open a BSC book and got lost inside the seemingly everyday lives of Kristy, Stacey, Claudia, and Mary Anne all over again. Lives that were both believable and inspiring- important qualities to this consummate consumer of realistic fiction. This graphic rendition is sure to attract a whole fan base of BSC readers. The full color illustrations, coupled with Telgemeier’s embedded wit, will appeal to tweens in your life and the plot line of Stacey dealing with being a newly diagnosed diabetic will resonate with a growing number of kids dealing with similar health issues. Thanks, Ann and Raina, for giving this reader a chance to revisit one of my childhood favorites from a new perspective. And for giving a whole new generation a chance to experience it for the first time.